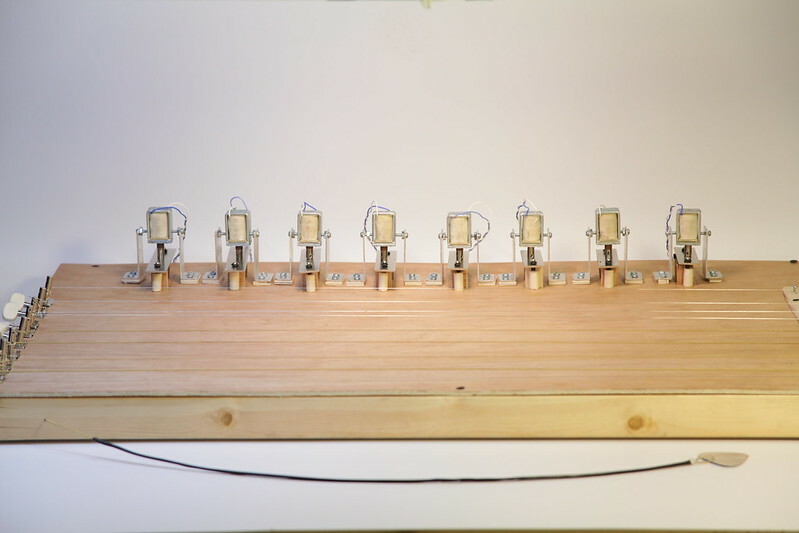 The Magnetophone is a sound sculpture with 14 guitar strings and 14 homemade electromagnets. 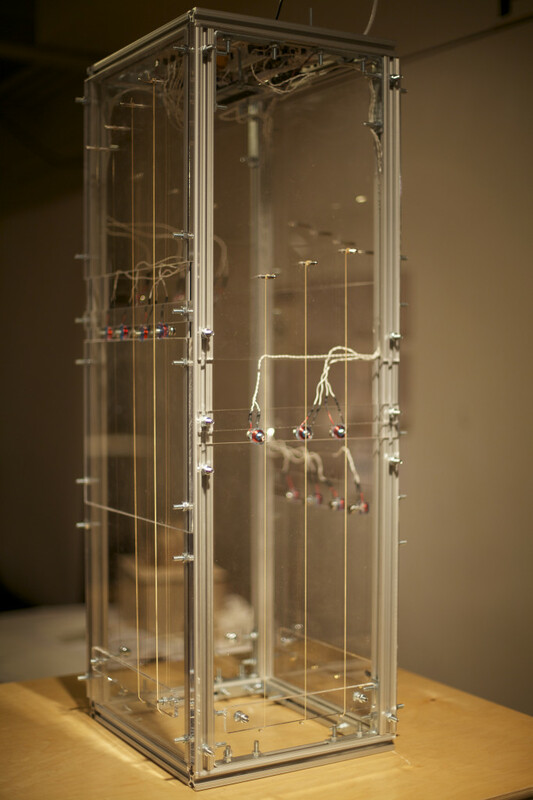 Continuously generative, electromagnetic fields make the strings vibrate. Pictures available on the project’s main page. 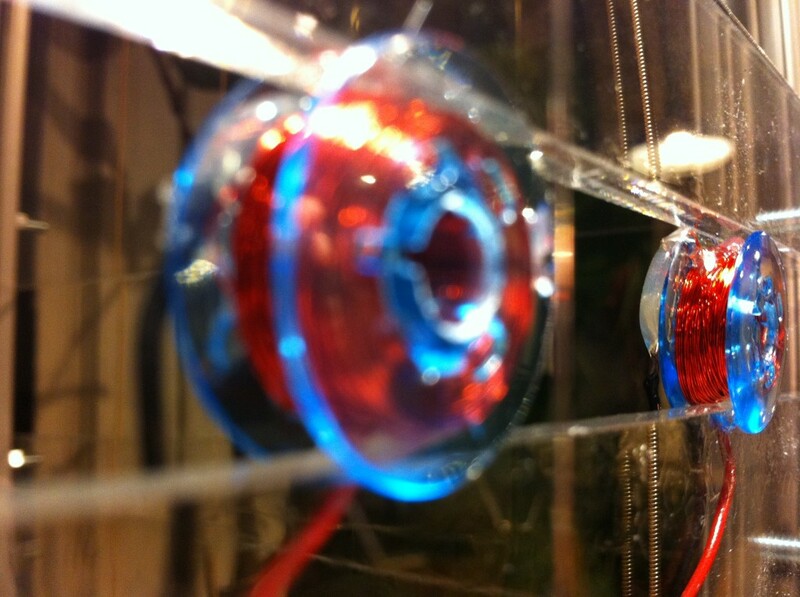 Constructed out of aluminum and acrylic, the Magnetophone measures 3ft tall. The circuitry sits atop the Magnetophone, with an Arduino Mega lowered down on a platform slightly below. 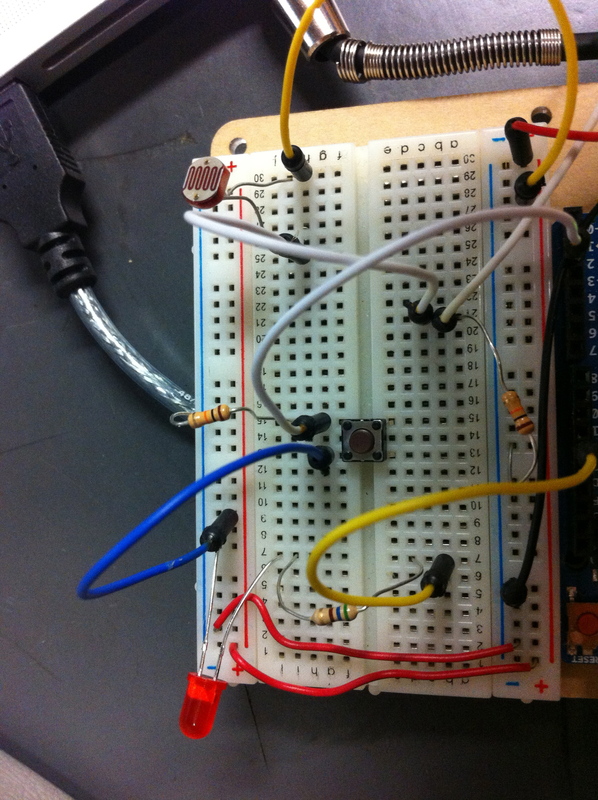 The Arduino sends out square waves to LM386 based amplifiers that power the electromagnets at the resonant frequencies of each of the strings. Its possible to sound overtones of the strings if upper partials of the harmonic series for an individual string are sent. 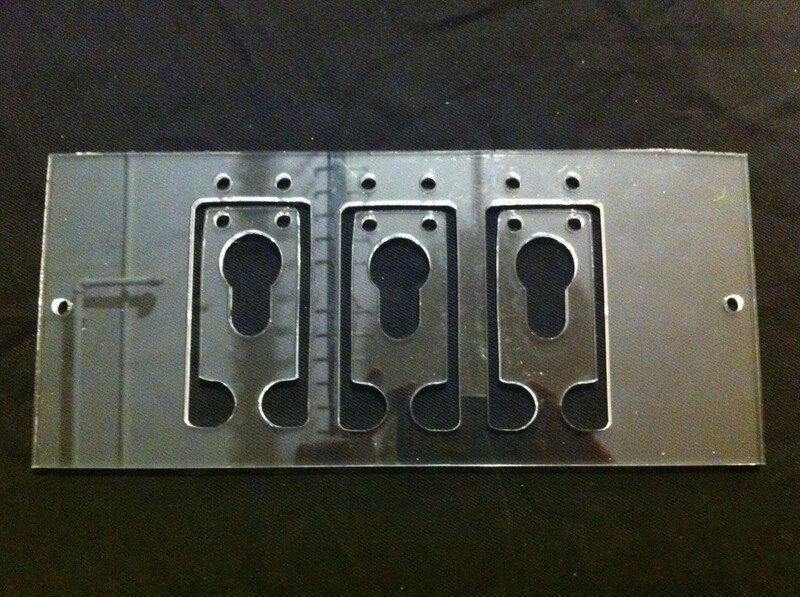 The circuit boards were acid etched, then treated with tinnit to keep them from oxidizing, thus the silver finish underneath. 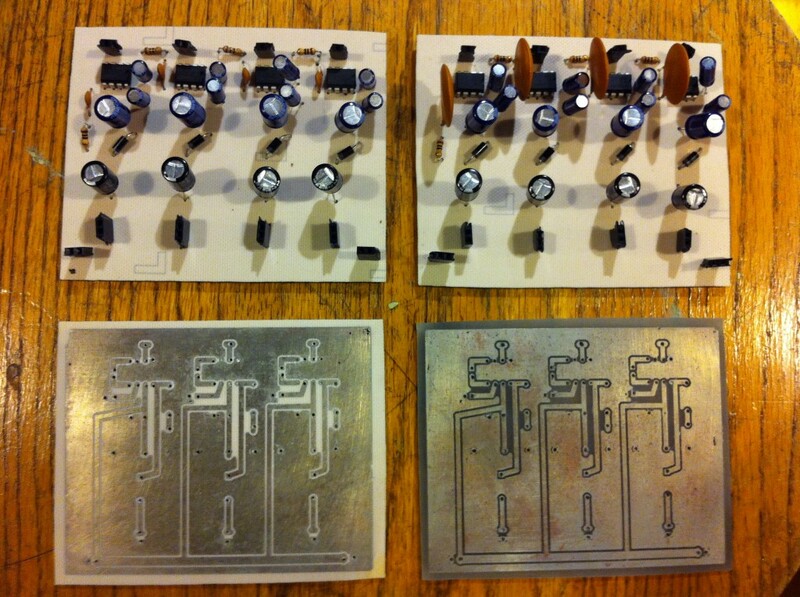 Each board has either 3 or 4 amplifier circuits, depending on which side of the Magnetophone it is being used for. I made the electromagnets out of sewing machine bobbins wrapped with 32 gauge enamel covered magnet wire. When electricity passes through the coil a magnetic field is generated. Since I’m sending a square wave to the coil, the magnetic field is oscillating on and off at the frequency of the wave. I put a bolt through the hole of the bobbin, which becomes magnetized and vibrates with the magnetic field. The magnetic field from the bolt pulls and releases the string making it vibrate, which makes sound. On the back of the bolt I put a small rare earth magnet. One earth magnet strengthened the magnetic field nicely, anymore actually weakened it. Instead of sending a frequency to the coil, an input coil (50 ohms resistance) can be substituted. 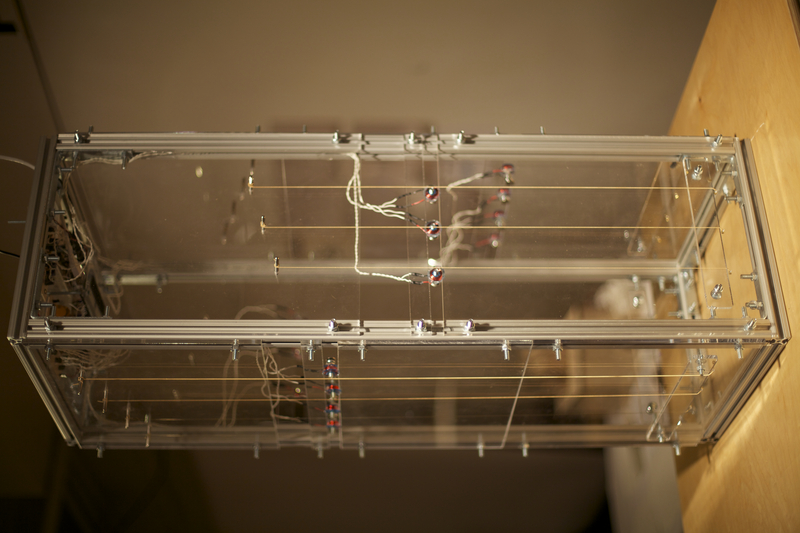 However, I found that the string vibrates more when it’s resonant frequency is sent rather than having an input coil. But I needed to be able to move the coils side to side as well, and found that I couldn’t do it with this system. I ended up going a much simpler route, holding the coils down in place with one strip of material above them. Acoustically, the strings vibrate the bridge, which vibrates the front plate, which pushes air molecules inside the resonance chamber back to bounce off the back wall. 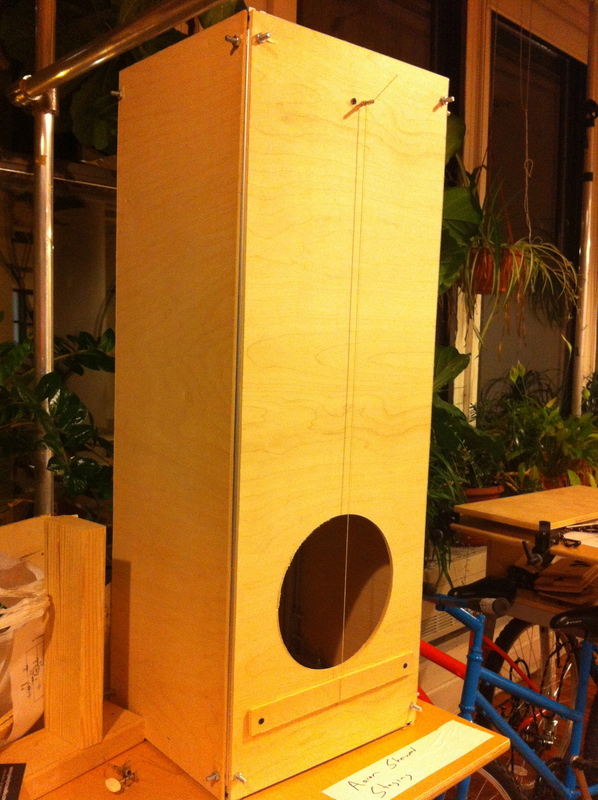 Plywood sheets are more resonant than 1/4″ acrylic, but the wood looked a little too much like a grandfather clock to me. Plus, I wanted it to look less like an instrument. The strings spiral up around the sides of the piece. 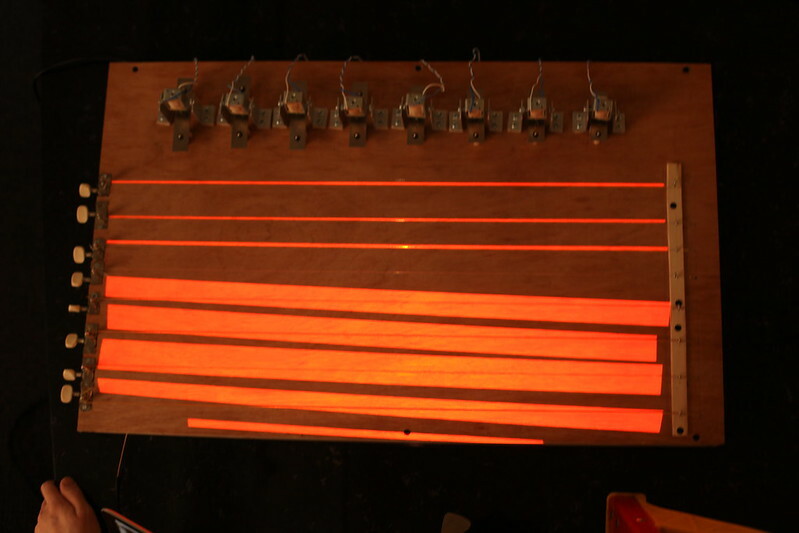 Different gauges of guitar string were used within each side to achieve variety on each side. They are tuned to an Ab major scale, but this was fairly arbitrary, the potentials for tuning being quite wide. The tone holes are also spaced so that no tone hole is facing another, my theory being that the air molecules should bounce back and forth against the sides inside the chamber. The Arduino is making some decisions about what to play, and will continually keep generating new music. 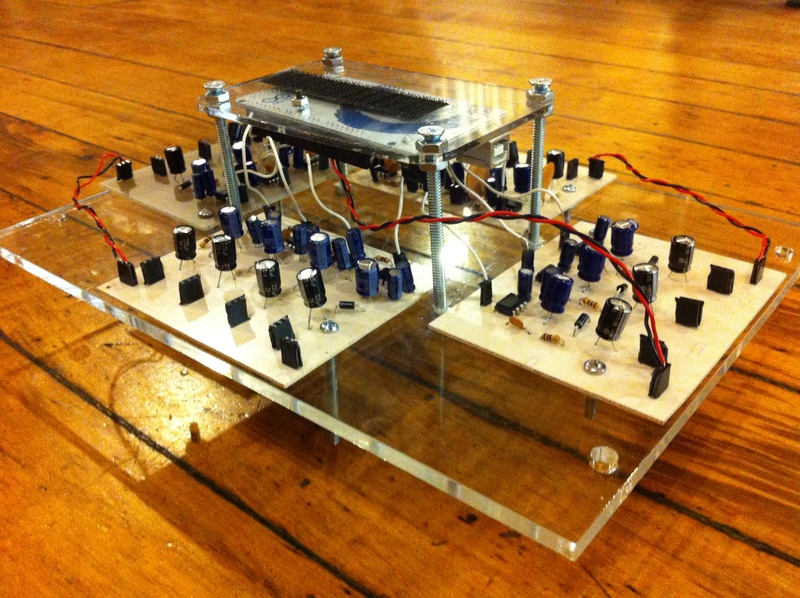 It switches between two modes, sometimes choosing random strings to play, sometimes generating a pattern or sequence, then looping that melody for a bit. Thanks to Scott Garner for aiding me in my times of need, and to the Basic Analog Circuits class at ITP for etching a ton of PCB boards for me. 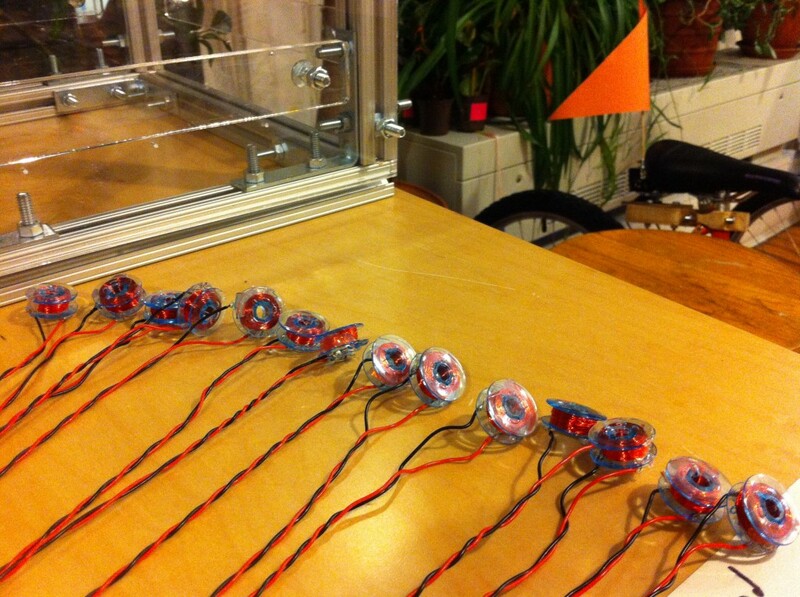 Special thanks to Danny Rozin, Eric Rosenthal, and Marina Zurkow for guidance, support, ideas, and bobbins. I’m wrapping my own magnetic coils for a project I’m working on and I need to wrap each coil 600 times. 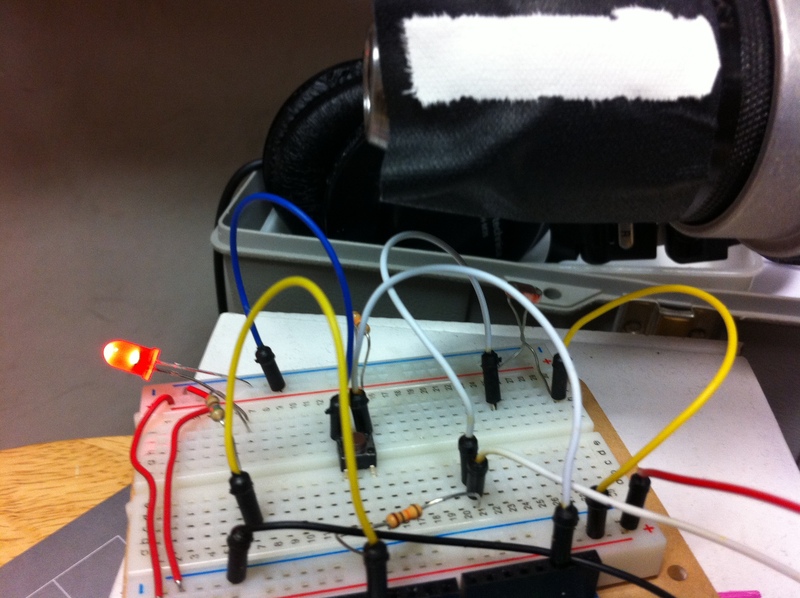 To help keep track of the count I made an assistant out of an Arduino and a photo resistor. 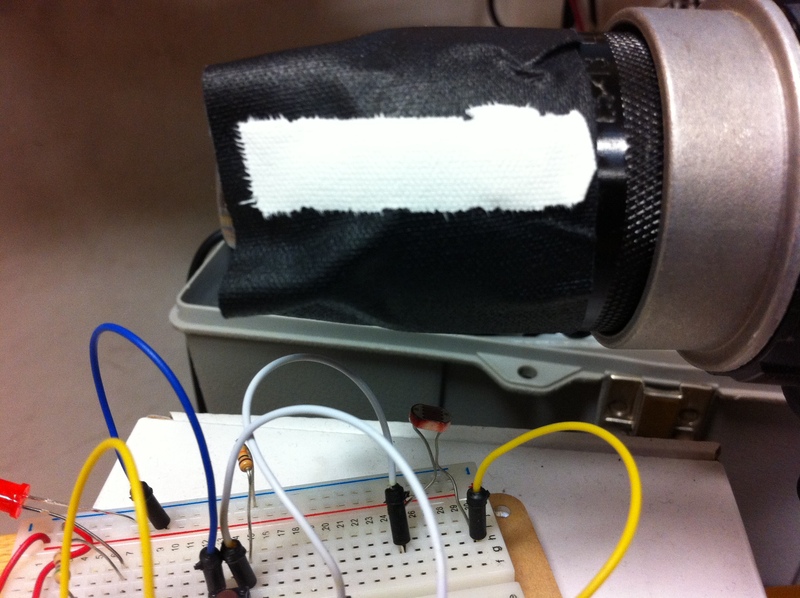 In this test I wrap black tape around the chuck on a drill and then put a strip of white tape over it. Shining a light from underneath reflects off the white strip as it rotates and shines more brightly into the photocell. 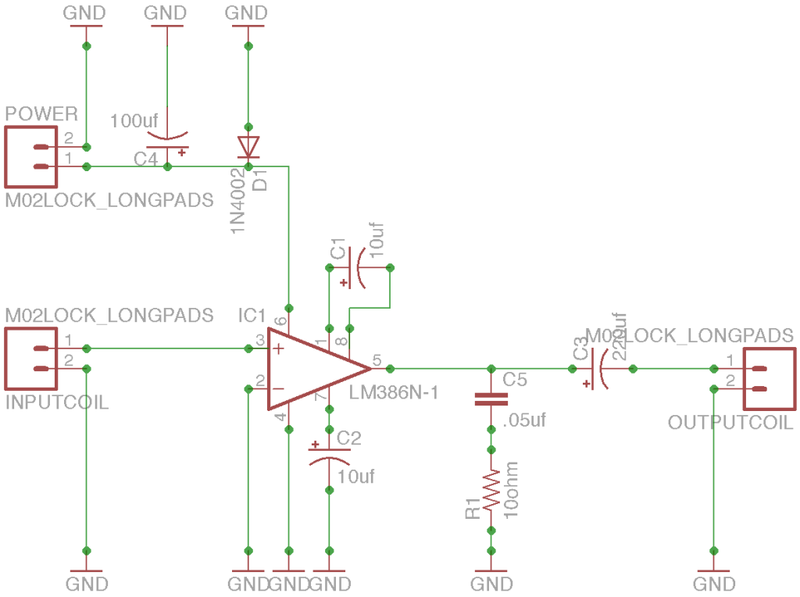 The Arduino uses this change in brightness to count how many rotations the drill makes and when it gets to the right amount an LED turns on. In the video example the light turns on after 10 rotations. Code is included below. The Glockentar combines a glockenspiel with a guitar. 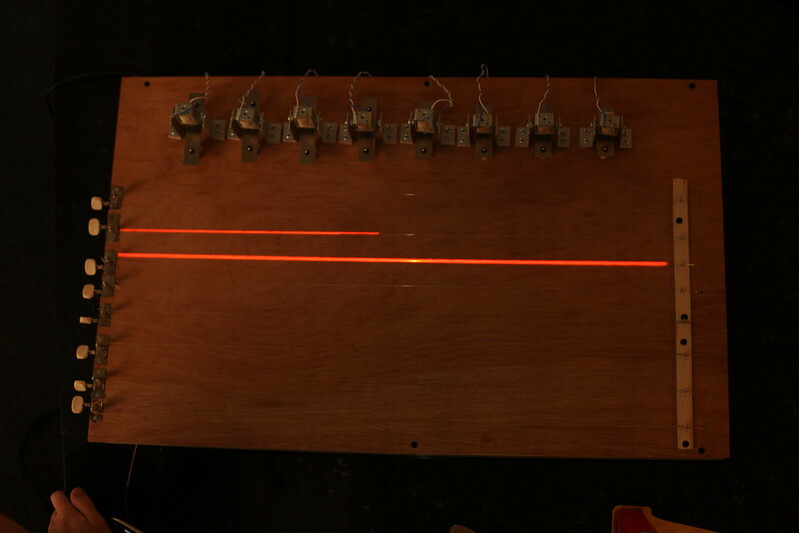 Each time a string is plucked a glockenspiel bell is struck with a solenoid, and a beam of light is projected across the length of the string. 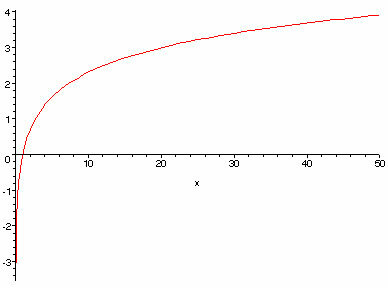 The light follows a logarithmic curve in terms of it’s speed as it goes up and down the string. It starts fast, pauses for a moment then goes back down the string. 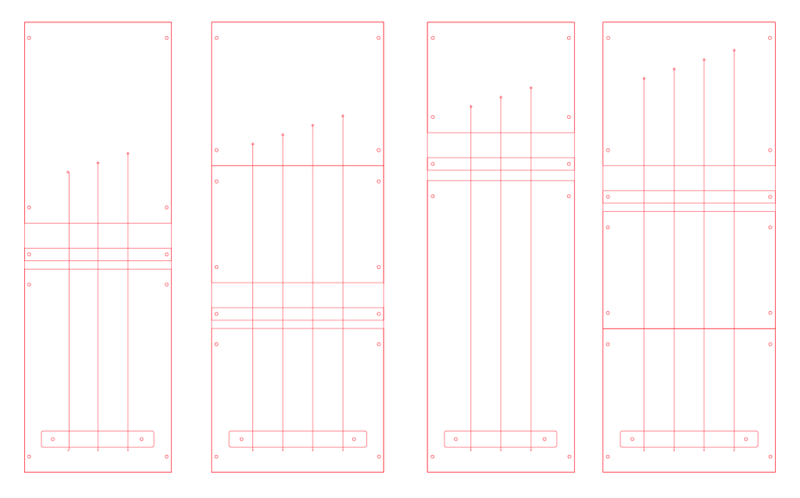 The lights are essentially rectangles made in openFrameworks, then sent to MadMapper via Syphon. In MadMapper they are then mapped to the strings. 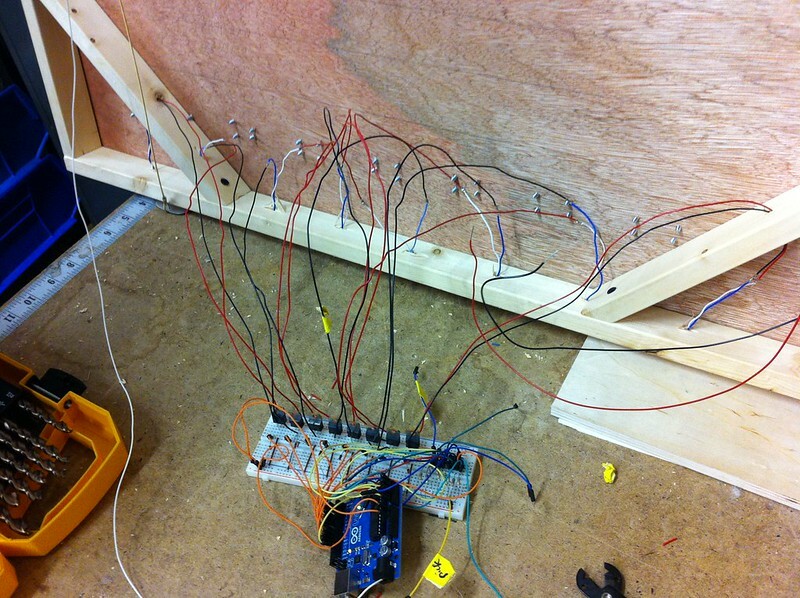 An Arduino is used to turn the strings into switches. 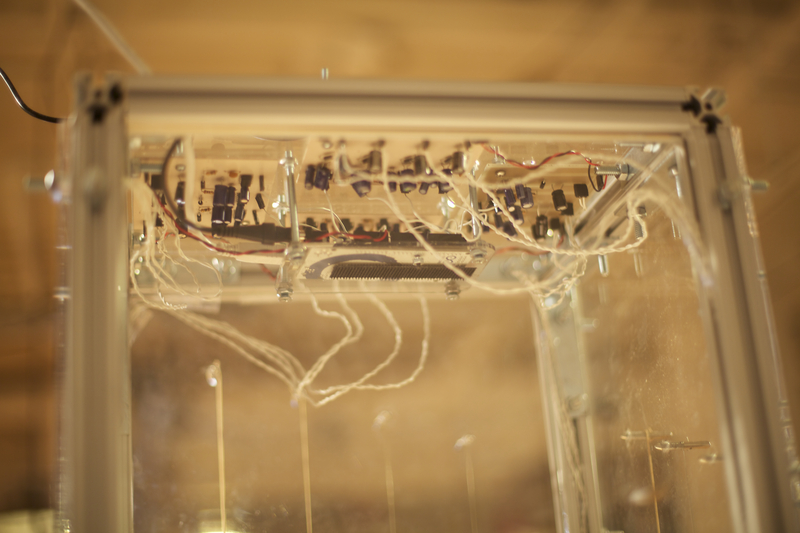 Each string acts as a ground, and electricity is sent to the pick. When a string is plucked with the pick the switch is closed and the solenoids and projections are triggered. 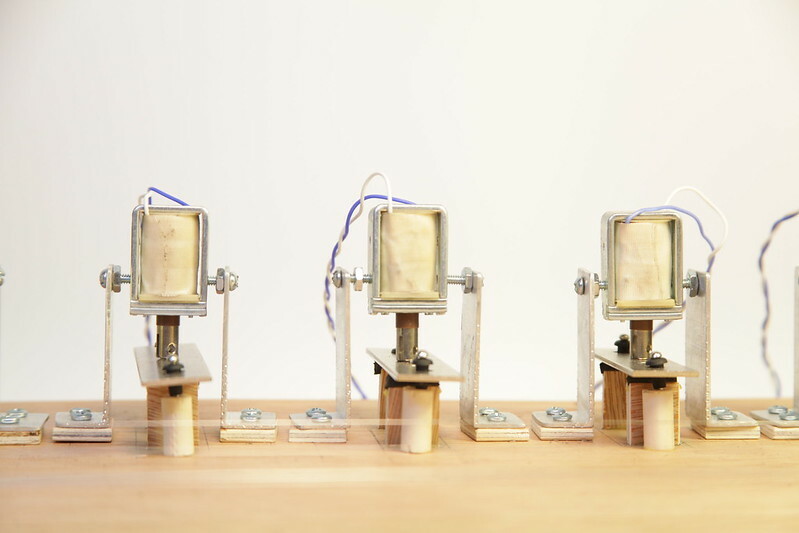 Testing a solenoid striking a glockenspiel. 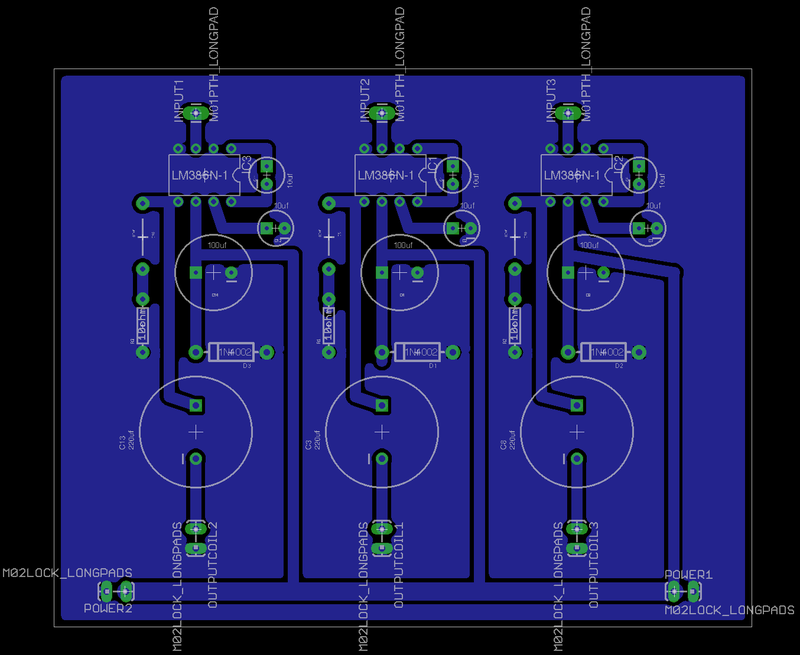 Will be improved once the timing of the strikes, and the spacing between the solenoid and bell is set. Works though! I used an Arduino to turn the strings of an acoustic guitar into switches (an update from this older post). Each time one of the strings is plucked a video is triggered in Max/Jitter and mapped to the frets of the guitar using Mad Mapper. Code for the Arduino sketch is below. To get the Max patch click here.